1 of 3 In slow-cooker bowl, stir together carrots, cauliflower, chickpeas, peas, onion, garlic, curry powder, coriander and red pepper flakes. Pour vegetable broth and coconut milk over top. 2 of 3 Cover slow-cooker bowl and cook for 3 hours on HIGH or for 6 hours on LOW. 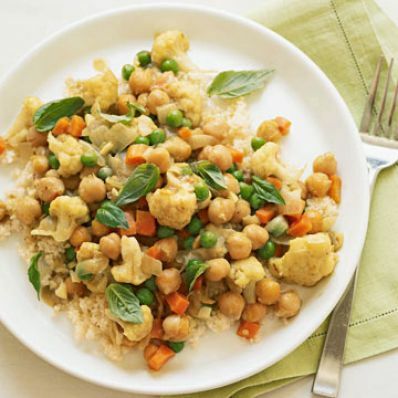 Remove 2 cups chickpea mixture to a small bowl and mash with a potato masher; stir in basil and salt and return mashed chickpea mixture to slow cooker bowl. Stir until well combined and heated through. 3 of 3 If using couscous, prepare according to package directions, about 5 minutes; serve with chickpea curry.